Home Financial Intelligence Demonetization India’s War On Cash Or Global Economic Warfare? It is not everyday that you wake up with a currency in your pocket that is worthless and Donald Trump as the President of the United States. It is a historic moment indeed. And although both the events may seem unrelated at first, under careful examination that doesn’t seem to be the case. The announcement of the discontinuation of the Rs. 500 and Rs. 1000 notes late yester night sparked off a wave of mixed feelings of panic, chaos and celebrations throughout the country. The move apart from having its pros and cons also raises certain critical questions. It a series of such questions that connects this two historic moments with its answers. Related: The Secret World Of Indian Currency Printers – Are new Indian notes printed with the involvement of blacklisted companies who supplied fake notes to Pakistan? Someone made a lot of money in the last 12 hours. But who? Is it a coincidence that the demonetization announcement was made right after British Prime Minister Theresa May’s 3 day visit to India? Is it also a coincidence that the move was announced just before the conclusion of the US Presidential Elections? 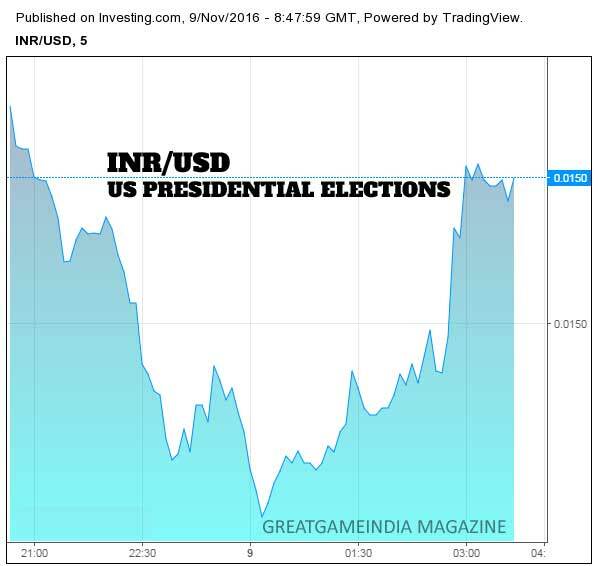 In the past 12 hours just after the historic announcement the INR/USD tanked and certain people made a lot of money after it started rising after US elections were concluded. People with information, not just about the US Elections but also on India’s economic policy. What does the printing of higher denomination Rs. 2000 note indicate? While much of the debate revolved around curbing the financing of terrorism through the proceeds of Fake Indian Currency Notes (FICN) and use of such funds for subversive activities such as espionage, smuggling of arms, drugs and other contrabands into India, and eliminating Black Money which casts a long shadow of parallel economy on our real economy, not much was said about the introduction of Rs. 2000 currency note. There is a direct relation between the printing of higher denomination notes and inflation and even hyperinflation. In countries experiencing hyperinflation, the central bank often prints money in larger and larger denominations as the smaller denomination notes become worthless. Bigger denomination notes are introduced in order to relieve the public from the inconvenience of a higher price. Are we entering into a new inflationary phase? The answer lies in a simple mathematical equation, probably one of the most feared one in the world—so feared in fact that it led to the removal of this famous American economist Irving Fisher’s theories from economics text-books in India since liberalization. The simplicity of this equation is that it empowers people to check what is happening in their country. Science has always to be simple and a tool to enhance the knowledge of people and empower them for self-governance. Though on government propaganda this greatest economist was slandered and ridiculed in US, but post the US collapse he was dug out from his grave and elevated to his rightful honor in US and Europe. Though mainstream economists rejected this theory to more complicated econometric models that often confuse and allows governments to manipulate and borrow while artificially keeping inflation low; today in the world after 2008 crash of all US-European markets and worldwide collapse this Fisher theory is revived except in India where we started discarding Fisher principles and adapting mainstream US economist theories for our own destruction. In India today we are seeing this exact scenario that occurred in USA and Europe which will result in the same destruction in near future if we do not do corrective measures. At least US and Europe have Indian, African, Middle Eastern resources to plunder and loot but where do we turn to? All symptoms of credit bubble are ready. Who will save India from the collapse sustained for keeping the western economies alive? Where is the Black Money, anyway? The governments move to eradicate black money is based on a premise that “black money” consists of hoards of cash which are held in trunks or pillowcases or buried under the earth which though duly shared by the layman as well, is not the case. While the govt is trying to curb this menace, most of the Black Money is already being routed into India from the tax-havens and legally invested into the country through FDI. This is called Round Tripping. One of the leading puzzles related to cross border flow of investment is the phenomenon of ‘Round tripping FDI’. Here, money from a country (eg. 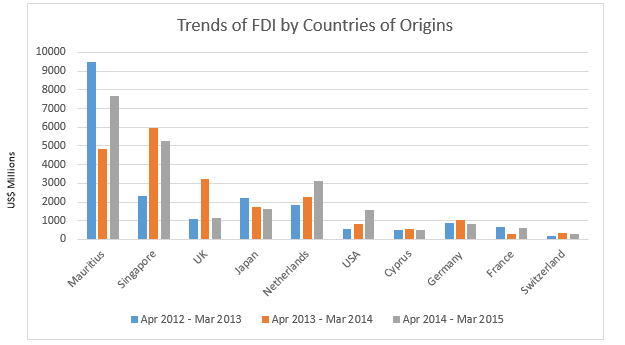 India) flows to a foreign country (Mauritius) and comes back as foreign direct investment to India. Round tripping of FDI refers to the capital belonging to a country, which leaves the country and then is reinvested in the form of FDI. Why the biggest sources of FDI are tax-havens countries? In 2008, an economic tumour ripped through the US and by 2011 it had spread to most parts of Western Europe. It resulted in large scale unemployment and inflation leading to several protests and had left behind a trail of crippled and near bankrupt economies. Even today, western economies are coping with the after effects of this economic crisis and few are still in recession. To squeeze every dollar they could into their economies, most nations resorted to wage-cuts, reduction in public spending, mass layoffs, austerity measures etc. With no end to their woes in sight, the Americans along with their European partners resorted to strategies which are reminiscent of the colonial era. The coalition entered into war with Libya with the noble objectives of spreading democracy, rule of law and human rights and ultimately fleeced the country of $2 trillion which prevented the collapse of these economies and gave them some breathing room. The western governments realized that the economic crisis was intrinsically linked to the standard of living of their people which if not protected could lead to the political radicalization of the entire west and could wind the clock back to the time when they were struggling to counter spread of soviet ideology in their countries. Donald Trump winning the US Presidential Elections is a very strong indicator towards this direction. While most countries are still reeling under the shock of recession, Dubai, which was afflicted by what was famously known as the Dubai Flu of 2009 came out of its effects relatively quickly. They miraculously came out of depression by virtue of a financial experiment that most western countries were skeptical of, but its eventual success led these nations to quickly adopt it. The experiment was a carefully drafted strategy which was devised by political pundits, banking and economic wizards and its script began to unfold in India since mid-2011. This process is explained in detail in our Bailout of UAE – From Dubai FLU to India FDI from our Foreign Countries Dictating India Series. There are many forms of War. Full scale military conflict is called First Generation Warfare and other Asymmetric Warfare methods as Second to Fifth Generation Warfare. Terrorism is a Second Generation Warfare. Black Money laundering out of the country that prevents the countries reach for economic resources thus limiting its ability to defend itself falls under Third Generation Warfare and outright economic plunder (like international scams of the nature of EMMAR or CWG which again limit the reach of countries towards their resources and thus hamper development) or disrupting IT communications and infrastructure is Fifth Generation Warfare. Regular armies defend against full scale aggression but the Asymmetric Warfare is conducted using intelligence agencies/bankers/businessmen using IBPK (Indian version of British Bankers-Pirates-Kings) in India or such similar institutions in other countries. 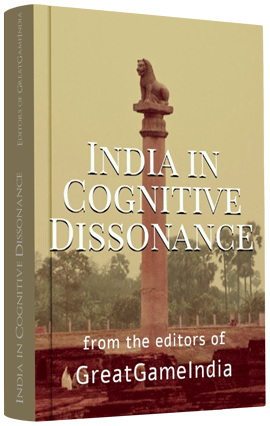 For those of you who are not frequent readers of GreatGameIndia or haven’t gone through our Foreign Countries Dictating India Series may find it difficult to grasp the subject matter of this article. We will be publishing a simplified comprehensive report on #DeMonetization shortly. Until than we request our readers to refer to the said references above for more clarifications or raise their concerns below in the comment section. The Jul-Sept 2016 issue of GreatGameIndia Magazine is dedicated exclusively for this purpose of understanding how international markets work and how exactly it impacts Indian Rupee, published as a special #FinancialWarfare issue.